The nymphaeas, better known as lotuses, are basically pond plants: one plant can sometimes cover up to 1 m2. Two species can be kept totally submerged in an aquarium. Size: up to 50 cm under water. There are two colored varieties of lotuses: one is predominantly green, the other mainly red. 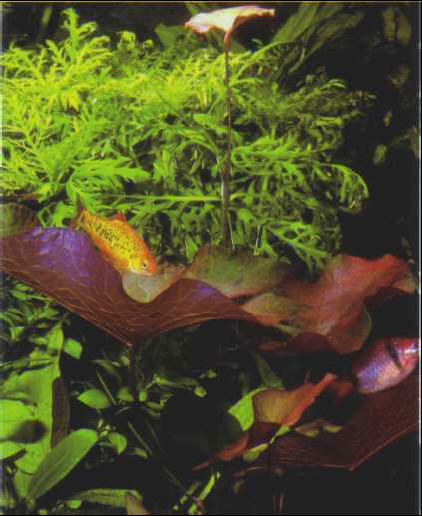 It must be kept in fairly soft water, with a covering of floating plants to provide shade. The leaves that reach the surface must be cut to enhance the growth of the ones underneath the water. When it reproduces, young plants appear on the rhizome shoots. Diameter: 50 cm. This species has exactly the same requirements and biological characteristics as N. lotus, but has a strong purple coloring. The purple lotus therefore stands out dramatically when surrounded by green plants. Size: up to 50 cm under water. ВИННАЯ ЯГОДА , сушеные плоды (точнее соплодия) инжира.